In the late 1970s, Dr. Pearse Lyons immigrated to the United States with his young family — Deirdre, Aoife and Mark — and a dream. His vision — to sustain the planet and all things living on it by applying his yeast fermentation expertise to agricultural challenges — came to life in his home garage with $10,000. Today, that vision is put to work by Alltech’s global team of more than 6,000 people around the world. Alltech focuses on improving animal, crop and human health and performance through its innovative use of yeast fermentation, enzyme technology and nutrigenomics. Its mission has always been guided by Dr. Lyons’ early commitment to the “ACE principle” — a promise that the company’s work must have a positive impact on the Animal, the Consumer and the Environment. Dr. Lyons was first and foremost an entrepreneur and a tireless innovator, with a keen scientific mind. His scientific expertise, combined with an acute business sense, helped revolutionize the animal feed industry through the introduction of natural ingredients to animal feed. He was widely regarded as an inspirational leader and communicator. He lived with passion and purpose — rising before dawn to begin communicating with colleagues around the world, issuing daily “One Minute Charge” motivational messages and traveling incessantly so he could meet his team members and customers in person. He built Alltech into the fastest-growing company in the global animal health and nutrition industry through innovative technology and strong branding. Today, Alltech is the only privately held and family-owned business among the top animal health companies in the world. The company’s reach has also grown far beyond yeast-based additives for animal feed to include award-winning beers and spirits, a crop science business and even promising research into human health challenges, such as diabetes and Alzheimer’s disease. -View the March 17 funeral mass that was held at the Christ the King in Lexington, Kentucky. -The family of Dr. Lyons and Alltech Ireland celebrated his life at a memorial mass on Saturday, April 14, 2018, in St. Peter and Paul’s Church, Dunboyne, Co. Meath, Ireland. A special celebration of life was also held at ONE: The Alltech Ideas Conference in Lexington in May 2018. In lieu of flowers, the family is encouraging donations to the Alltech ACE Foundation, a 501c3 nonprofit organization that funds a variety of philanthropic endeavours around the world from disaster relief to primary schools in Haiti. 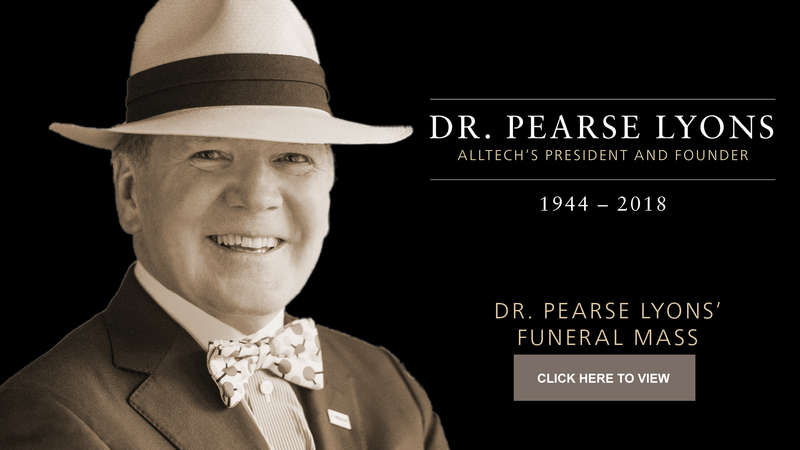 Pearse Lyons Funeral Mass highlights reel - Download here. Media Statement - To access the media statement, please click here. Members of the media, please contact press@alltech.com if you have any further queries. Photography - To access high resolution photography for editorial use, please click here.